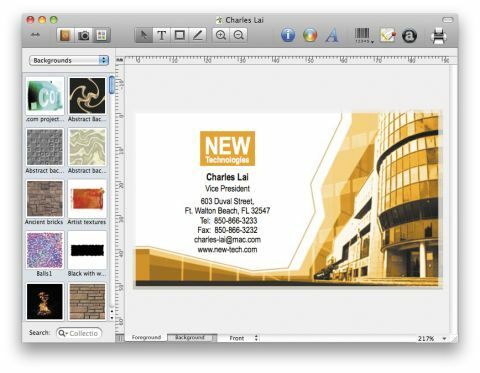 Business Card Composer 5 takes the hassle out of creating pro-quality business cards. Tedious work like sizing is done for you, so you can enjoy putting your designs together without worrying whether they're correctly configured when you come to print them out. There are print templates for more than a hundred types of ready-made business card stationery from a dozen top manufacturers, as well as facilities for exporting your layouts or printing at home. This app offers at least 740 ready-made cards for you to play around with and customise. Or you can start from scratch, using your own clip art and backgrounds or those bundled with the program. A range of card formats are catered for, including landscape, portrait, folding, double-sided and even business card-sized recordable CDs. The app as a whole is beautifully Maclike, and brilliantly integrated with OS X. Version 5 isn't a great leap forward from its predecessor, but it offers some useful new features. Business Card Composer 5 integrates with Google Maps, enabling you to print a small street map on your card marking your premises' location. 2D barcodes encoded with details such as your address, URL and more can be produced and presented on your card for reading by a range of devices, and it integrates with iPhoto '09 and Aperture, including support for iPhoto events. Existing users can upgrade to Business Card Composer 5 for $20, or free if bought after 1 August 2009.